We briefly touched on the Confidentiality, Integrity and Availability of your company’s data back in August. This time, I’ll focus on the first of the CIA’s — Confidentiality. 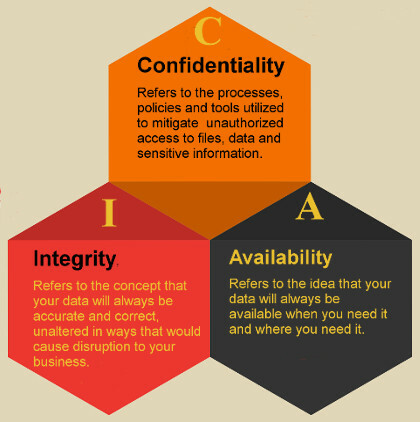 Confidentiality refers to the processes, policies and tools utilized to mitigate unauthorized access to files, data and sensitive information. This could mean mitigating unauthorized access from hackers to any of your files or sensitive information like credit card numbers and passwords, or it could mean preventing unauthorized access to specific types of data from employees, vendors and clients. We’d want to protect against hackers accessing your data for obvious reasons. They almost always have malicious intent, whether it be for financial gain or causing trouble for your organization. Employees, vendors and clients shouldn’t be able to gain unauthorized access, either, but for less obvious reasons. Usually there won’t be malicious intent in those cases, but you most likely would not want an employee to see payroll data, or vendors and clients to see information about each other. In this age of digital communications, your organization’s key stake-holders will have increased access to more of your information. Even if hackers disappeared tomorrow, vendors and clients will likely need to be authorized to operate within your network. With the potential effect of that kind of external access on your firm’s health, protecting the Confidentiality of your data should be a company-wide priority.